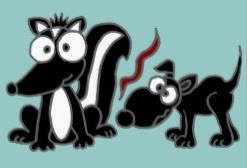 If your dog gets sprayed by a skunk, DO NOT bathe or wet your dog! Any water that touches your dog’s coat will set the skunk oil causing the odour to stick around for months! Bathing your dog in mouthwash, tomato juice, peroxide, baking soda etc will not get rid of the smell! But fear not! Fur-Ever Loved has an amazing product called Epi-Pet “Pet Skin Care Product Line” which will get rid of that nasty odour! The most important thing is to NOT bathe or wet your pet before using this product. You can bring your pet in for us to apply the product, or you can buy a 16 fl oz bottle of it for only $18 in our salon. Or ask for your free sample in the salon!